Last year we have been busy all kinds of amazing custom bikes for so many people. 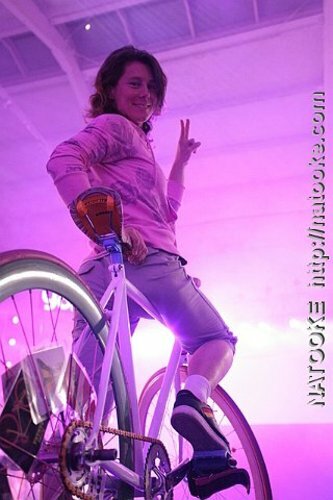 As we are re-doing our Natooke website I am uploading pictures of the bikes we built for customers, as well as our happy customers and friends. 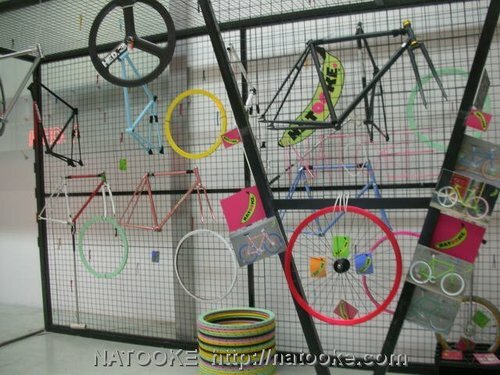 Here are just some pictures of Flying Banana bicycles. It has been many months since I last regularly wrote blog entries. Because some friends and some fans complained about that I decided for the year 2012 I will try to update my blog. 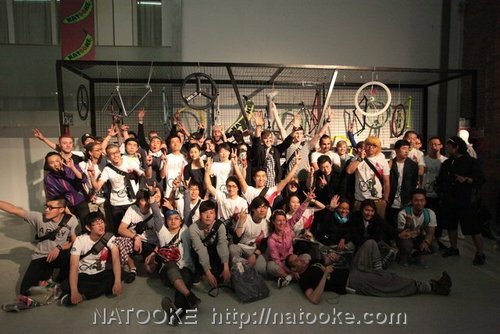 Natooke shop has been very amazing last year and I hope we can continue the same way in 2012. I am happy to have met so many interesting people that just walked in either by coincidence or because they had read about us or seen us on TV. 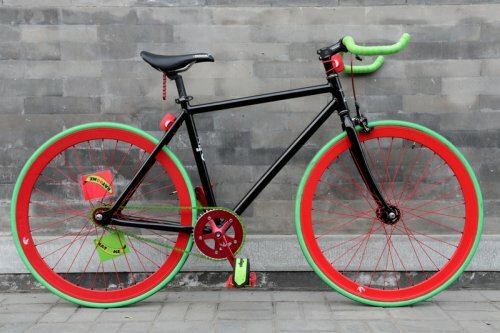 Let us have lots of fixed gear riding fun together in this year. 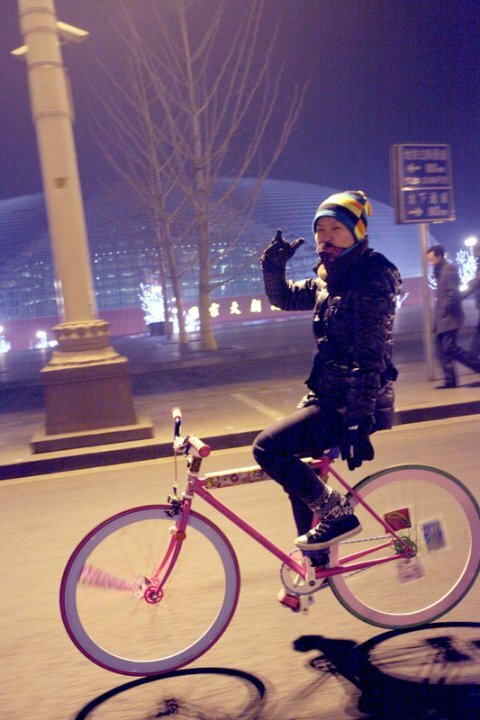 New Year’s Eve we had a Natooke fixed gear bicycle ride to end off the year 2011 and greet the New Year while cycling along Beijing’s streets. We waited for the countdown on a huge clock near Xidan. 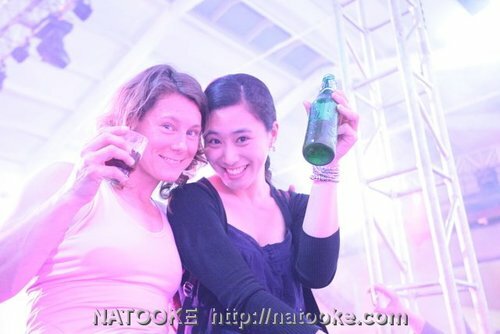 Recently we have some really enthusiastic girls come to rides and events. Keep up the hard riding! 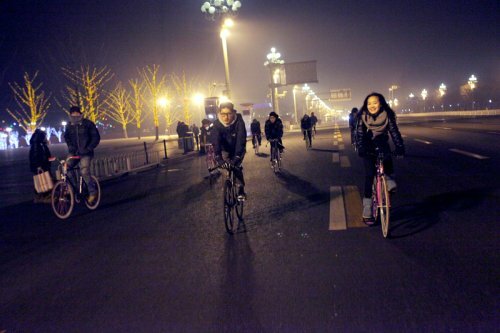 Beijing is getting colder and there are not many people on the streets at night. 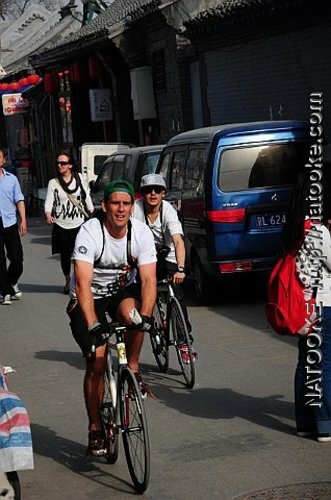 That made for a huge space for us cycling especially on the extremely wide bicycle lane of Chang’An Boulevard that goes right through the center of Beijing. The remaining group did a very brief stop on Tiananmen Square before the guard came to tell us to keep moving on. Then we went to get some early morning food at a small Chinese restaurant. We just stacked our bikes outside of the restaurant. Unfortunately a drunk driver in a SUV drove past and drove too close to our bikes so his car must have touched the most outside bike and the drove over that bikes‘ back wheel. But we figured a bent wheel in the first hours of the year brings good luck. More pictures are all in this gallery. 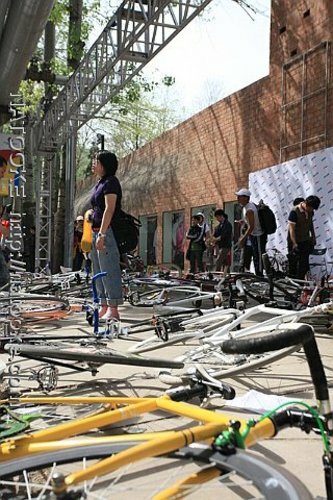 Here are some amazing videos from the April 16th Beijing Lining Bikeboy event. The first video is done by Shannon who had his camera mounted on the fork of his bicycle and got some amazing shots. The second video is done by „Niurenku“. There team had come to film during the event. I like that they went to 4 of the 5 stations and filmed there too as well as of course the beginning of the race. But I need to improve my Chinese. 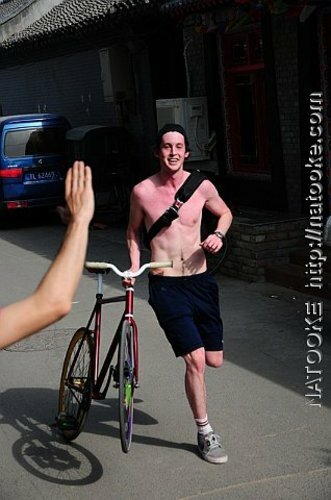 After the Beijing Bikeboy Alleycat race Lining organized a fixed gear bike party with MC hotdog, DJ Sam Lee and 24 Herbs boy band. 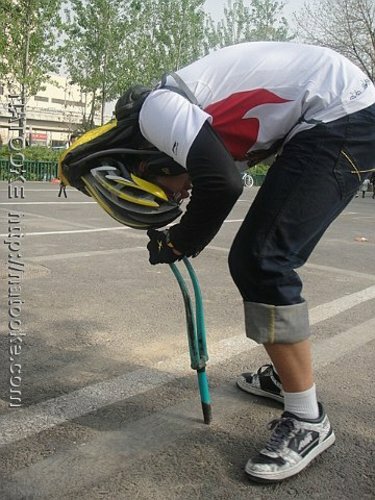 And of course us fixed gear riders. Mitchell and me representing the whole Team Natooke got to stand around on stage for a long while. Then was our moment where we were given 60 sec to show some tricks on the tiny stage. Mitchell and I did synchronized backward circles. 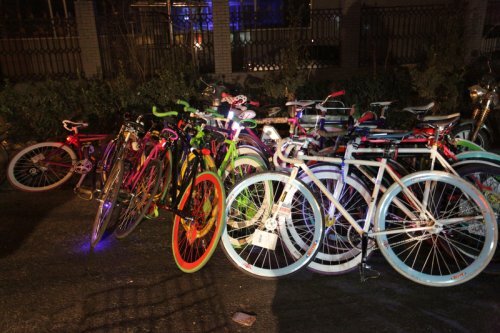 The fixed gear party included the fun STC JisuPK. 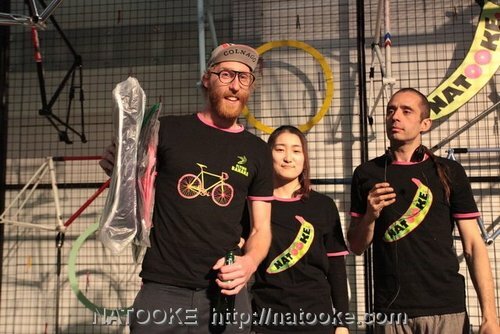 It was setup on stage and Sara and me from Team Natooke raced against the guy from Japanese T19. It was a long 500m race and I actually won! We took some pictures with the different crews. Here is me and the American FTC team with the famous skateboarder John Cardiel. Here are Mitchel and me with the Taiwan Nabiis guys. 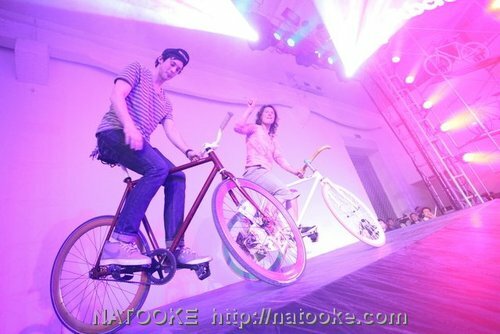 Here are more pictures of the Lining Bikeboy Party. Our fixed gear bike friend Peter Carney had set up lights and taken shots of the various fixed gear rides during the event. At the end when he and his partner were starting to pack up the Natooke staff started goofing around in front of the camera. That was so much fun! Before the Lining Bike Boy event there was filming of the different fixed gear bike teams. 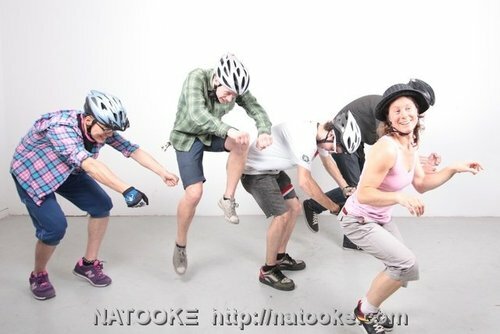 So they came and dressed us up in Lining clothes and shot this short clip about our NATOOKE fixed gear cycling team. Click here to see the video. 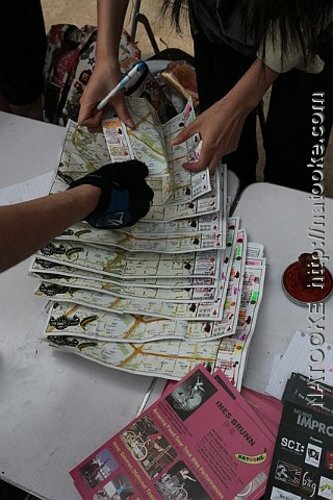 As Natooke team was requested to race and later asked to organize the Bikeboy alleycat we had to do it the way that the checkpoint locations are communicated in advance. There was a start and end location plus 5 locations scattered across the city to make more than 1 possible route. At each checkpoint there were Alleycat Checkpoint Games. 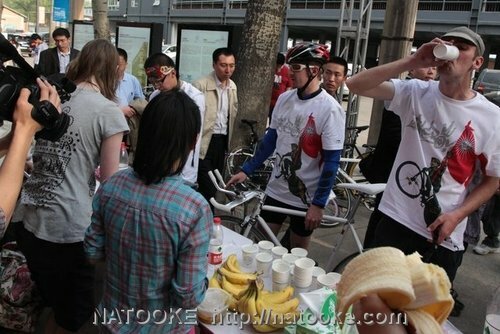 All racers of the Beijing Bike Boy Alleycat had to come to the Natooke shop checkpoint where there was a ping pong game. Some came running without shirt. By the way, we have all the manifests at Natooke now. So if you want your manifest back as a souvenir, just drop by the shop. 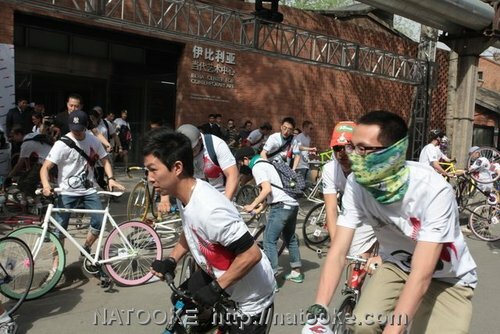 Here is a picture of all the April 2011 Beijing Bikeboy Aleycat winners. Congratulations! 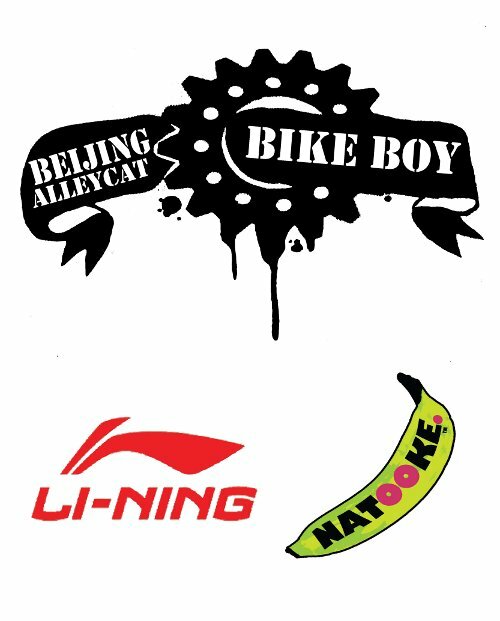 Soon will be the Beijing Li-Ning Bike Boy Alleycat Bike Race (http://www.natooke.com/en/home/coming-event-bike-boy). 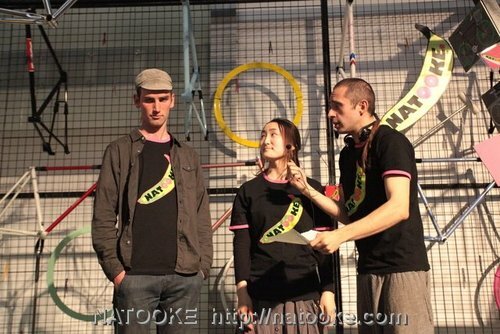 It will be held on Saturday April 16th starting a 2:30pm in the Beijing 798 art district at the Iberia Center for Contemporary Art. It will be a fun race through the city to 5 different check points and then back to the starting point. There will be prizes for male and female racers from Beijing as well as separate prizes for male and female racers from other cities. 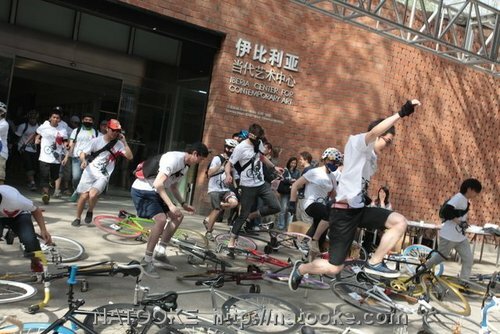 So if you have a fixed gear bike then quickly register (http://bikeboy.natooke.com) and come on out and have fun with us. 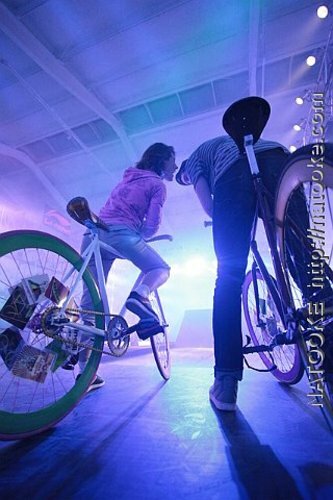 After the alleycat bike race there will be a Li-Ning fixed gear party at the 798 Iberia Center for Contemporary Art. 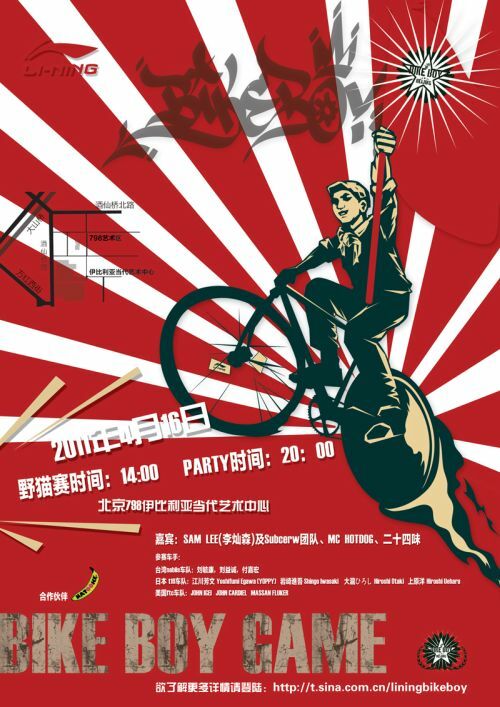 The party includes guests like Sam Lee, 24 Herbs from HongKong, Taiwan MC HotDog, Japan T19 Fixed Gear Team, American FTC Fixed Gear Team (http://t.sina.com.cn/liningbikeboy) and also the STC JisuPK race system http://stcbj.com/en/jisupk. 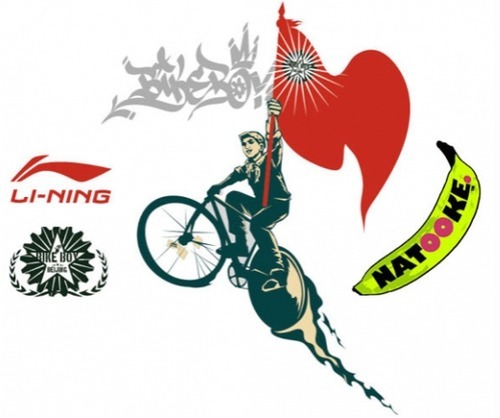 In preparation for the alleycat race let us do a bike ride on Wednesday April 13th starting at 8pm at Natooke shop (http://www.natooke.com/en/where-to-find-us). Natooke shop is one of the race check points. Let us ride to all the other check points so that we know where they are. 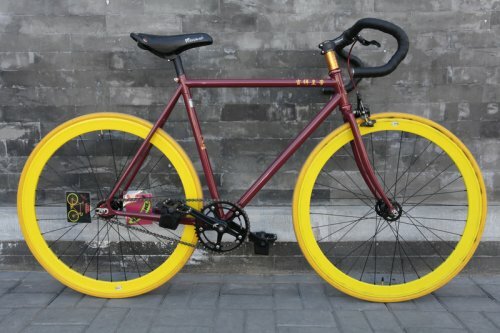 If you do not have a fixed gear bike then let us know as we have a few for rent. But please book one in advance to make sure we are not booked out. 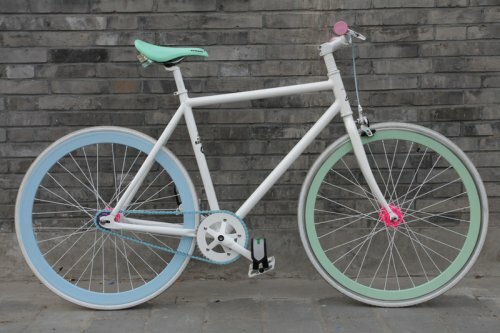 Looking forward to seeing you on your bikes! Let us blast around the city. 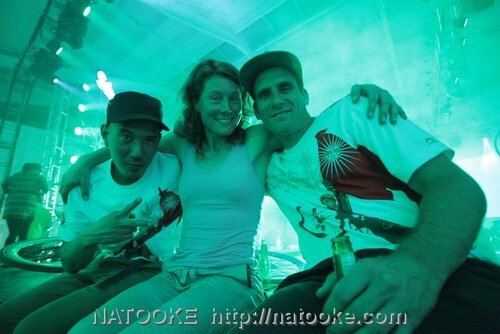 Ines and the Natooke team.